It is my pleasure to host Karen Ingalls today. Please welcome Karen and lets support her by leaving a comment, sharing this post and purchasing her book. And now…. Today’s interview is with Murray Clark (aka Michael St Germain). 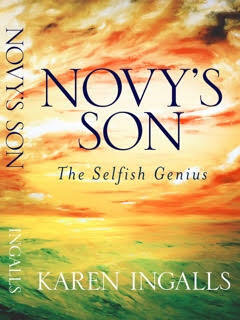 He is the main character from Novy’s Son, The Selfish Genius. Mr. Clark, you had to move three times and change schools when you were a young lad. How did you feel about those major changes? The first time I was scared and angry. I was only five and did not understand why having a new brother or sister would mean I had to leave my parents and home. But, I loved Uncle Leon and Aunt Helen and I had a good time there. You had jealousy with your brother, Richard. Did you ever resolve those feelings? I don’t think my brother or dad knew about my jealousy though my mother did. And, I still have jealousy of him. He seemed so perfect, likable and smart. He could do no wrong. If he had lived a full life, I suppose he and Helen would have married and told Karen the truth of her birth. I don’t think I could have stood for that. What made your relationship with Grace so special? She was the first and only woman with whom I could be totally myself. She was smart, beautiful, and a good listener. As I look back she reminded me of my mother though they did not look alike. Her life was cut short and I will always be angry about that. Who are you angry at? You appear to be angry with so many people and events throughout your life. I had to give this question a lot of thought. In the end, I guess I am angry that my life was so hard. My dad was so strict and no matter what I did it not seem to please him. And, if there is a God (which I do not think there is) I am very angry at Him. He caused the early deaths of Uncle Leon, Aunt Helen, and Grace all of whom I loved. And I am angry that He took Richard at such a young age from which Dad never recovered. A final question: Do you think you were a good father to Joan and Karen? I wish I could answer that with a yes. I was a better father to Karen, but as I look back I was wrong to disown Joan. I should have tried to work things out with her, but I had so much going against me. Her mother hated me and was always doing things to put a wedge between my daughters and me. I regret how I treated Karen those last years. I see now that she always acted in my best interest and did everything possible to help me. I blamed her for my finances, health, and living situation the last years of my life. With all my faults as a father, I did love my daughters and tried to do the best I knew how. Karen Ingalls is a retired registered nurse with a master’s degree in human development, which was a double major in psychology and human services. She is the author of the award winning book, Outshine: An Ovarian Cancer Memoir from which all proceeds are donated to gynecologic cancer research. Her second novel is Davida: Model & Mistress of Augustus Saint-Gaudens. Her first novel, Novy’s Son challenges the reader to examine the issues of alcoholism, sexual addiction, and family dynamics. 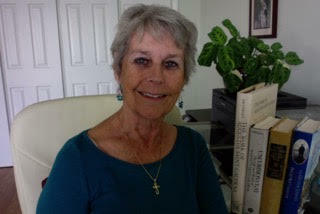 She has also written poetry, short stories, and has had articles published for professional journals. Karen also does presentations to promote her books and on subjects of health/wellness. This entry was posted in 4WillsBlogTour and tagged 4WillsPublishing, alcoholism, CHARACTER INTERVIEW, Davida: Model & Mistress, family dynamics, health/wellness, Murray Clark, Novy's Son, Outshine: An Ovarian Cancer, sexual addiction, WELCOME KAREN INGALLS. Bookmark the permalink. A fun post, Karen. Best wishes. And thank you, Jennifer for reflagging this on your site. It is much appreciated. Thanks for doing the character interview, great to stop over (little late). Thanks Shirley for hosting. Jennifer, thank you for the compliment. It was an interesting process to do the character interview. Glad you stopped by. Relationships with parents are so crucial – i have nothing but admiration for how you told your father’s story so honestly, Karen. Thanks Jan for stopping by. Its appreciated. By the way, I like your new photo. Thank you, Jan. It was not easy to write some of the things I did, but they were based on his life or those of others. The interview is an eye opener for your book Karen. It will surely help me to understand the story better when I read it. Thank you Shirley for hosting her. The character and story are based on facts. It is a story of my father and some men I counseled as a nurse therapist. Our society needs to start addressing the loss of sons and fathers relationships. The loss of a father passing down to a son how to be a man/father was coined the “Iron John” principal in the 1980’s by Robert Bly. This is a true situation for my father, the main character, and other men I counseled as a nurse therapist. We appreciate you stopping by Gwen. Thanks for the warm welcome, Shirley! Natalie, thank you for your compliment and all your support during this tour. Thank you Natalie for visiting and supporting Karen. Fascinating, Karen. So interesting to get insight into people and their regrets they don’t express. If only more of us would express our regrets!! This character’s life is based on a true story. Thank you for your comment. Rhani I’m so glad you stopped by. Thanks so much. Rhani, glad you enjoyed the character interview. The main character is based on a true story. Thank you for sharing. Hasn’t the word got out yet? Nobody is here? Calling all members!!!!!!!!!!!! It feels like it’s harder to get people on the weekend. It is Saturday and I am sure people are out doing other things. Shirley, you have been wonderful hostess…thank you so much.